An error has been spotted in the "Diary Dates 2018" section of our February and May 2018 editions of the printed Newsletter sent out to members. 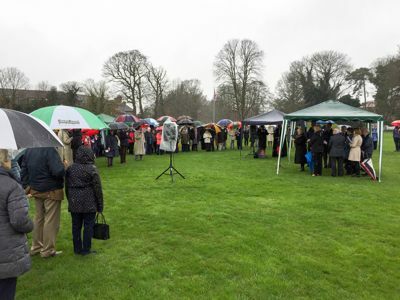 Despite the rain more than 120 Cobham residents attended the re-dedication of the Avenue of Remembrance on Sunday 8th April 2018. The Avenue of Remembrance is an important memorial to those who lost their lives during WWII and lived in and around Cobham. 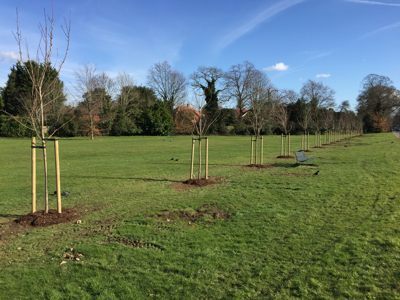 A community initiative to restore the Avenue of Remembrance Cherry Trees in Cobham was launched by Elmbridge Borough Council and local organisations in September 2017. The much-loved and admired memorial was originally created and dedicated in 1946 by the Cobham Womens’ Institute who planted the cherry trees in commemoration of local service people who lost their lives in WWII. Over the last 70 years the avenue had lost its impact, due to some trees becoming diseased, and replacement trees not thriving. A consultation carried out with Cobham and Stoke D’Abernon community in September 2017 highlighted a wish to restore the avenue to its former glory. A recommendation to renew the Avenue of Remembrance to protect it for the future was approved by Elmbridge Borough Council who also financed the project. 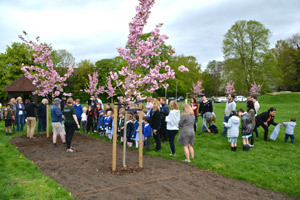 Works started in earnest in February 2018, culminating in a "Topping Out" ceremony on 15 February to mark the planting of 46 Cherry trees to replace the original ones. The replacement trees were grown by Barcham Trees from Cambridgeshire. They are now in place to mark the centenary of the end of WW1, and will hopefully be fully mature for the WWII centenary commemorations in 2039-2045. 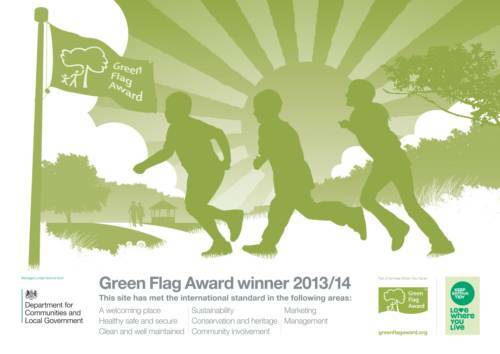 This project is a fantastic testament to the dedication and commitment of local organisations to look after and nurture their environment, in partnership with the Borough Council. The organisations involved in this initiative are Cobham Cedar Club Women’s Institute, Royal British Legion Cobham Branch, Cobham Conservation and Heritage Trust, Cobham and Downside Residents’ Association, Stoke D’Abernon Residents’ Association and St Andrew’s Church Cobham, together with other churches in the area. If you have a Cobham Village Card and purchase one of NFU's Home, Comprehensive Car or Equine policies, through the local Cobham NFU Mutual branch, they in turn will make a contribution equivalent to 10% of your new policy premium into a charity of your choice. 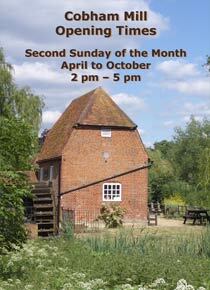 If you choose the Cobham Conservation and Heritage Trust, this will help to fund our projects and our other work. For a quote, please contact 01932 865 667, or pop into 5 High Street, Cobham, Surrey, KT11 3DH, and remember to mention 'Cobham Village Card' and 'Cobham Heritage' as your chosen charity. If you don't already have a Cobham Village Card, get it free via the Cobham Village website www.cobhamvillage.co.uk. The Cobham Village Card is issued by the Cobham Chamber of Commerce. 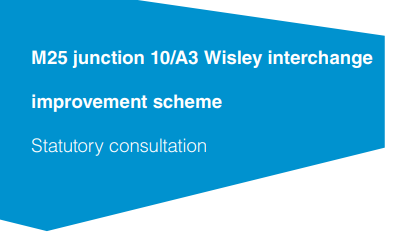 Alterations to the M25 junction 10 and the Painshill roundabout. You will have read about the proposed alterations to the M25 junction 10 and the Painshill roundabout. These have major implications for all of us in Cobham and the surrounding area. As part of these, from the top of Painshill to the lights on the byfleet road there will be extra lanes in each direction to allow more space for vehicles to queue! Painshill park will lose a chunk of land behind its unique follies. Examine the plans at Cobham library available until 26th March 2018 and respond to the consultation. Go along to one of the public information events (see below) and respond to the consultation. Support Painshill by going on to their website (www.painshill.co.uk/a3/) and supporting their petition to Highways England. 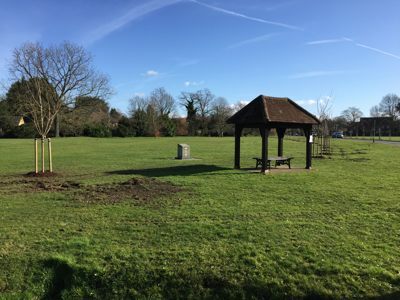 We are glad to report that the Avenue of Remembrance cherry trees at the Tilt which were in such bad condition, have now been replaced thanks to Elmbridge Borough Council following the public consultation at the end of 2017. The opportunity has been taken to move them a little further away from the busy Stoke Road to minimise the effects of the salt spray that comes from the road during icy conditions. The trees are a substantial size and should flower soon and make a stunning avenue once again. Please make a note in your diary for the Dedication ceremony for the new trees. This will be held on Sunday 8th April at 12.30. More details to follow.